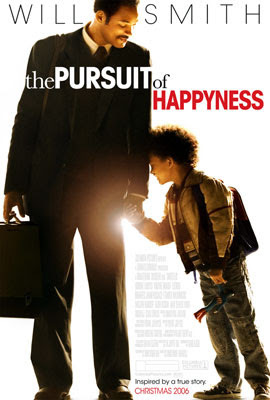 Mrs. Zwicker and I, along with some friends, watched "The Pursuit of Happyness" the other night. It's based on the true story of Chris Gardner, a down-on-his-luck single father who struggles to make a living to support himself and his son. Gardner, whom Will Smith played quite well, doesn't give up no matter how bad things get, even when he and his son lose their apartment and sleep in a public bathroom those nights Gardner and his son are not fast enough to get to the homeless shelter. Through it all, Gardner maintains not only a positive attitude for himself but for his son as well. The ending is predictable-Gardner gets a job as a stock broker and goes on to make a very nice living for himself. The movie is meant to be uplifting, showing an otherwise average guy who overcomes the odds to earn a good job so that he can take care of his son. While I usually enjoy those types of movies, assuming they are well done, this one left us all flat. The movie was just so depressing and exhausting until the last scene, which lasted all of two minutes. We would have like a little more showing of the reward for all of Gardner's efforts and perseverance. As I thought about the movie over the next few days though, I came to appreciate a message that Gardner mentions at one point but remains otherwise unspoken. Gardner refuses to complain about his lot in life and instead maintains a positive attitude. Not only that, but he also acknowledges that society doesn't owe him anything. He correctly says that the Constitution does not guarantee life, liberty and happiness. It instead guarantees life, liberty and the pursuit of happiness (the spelling in the title is from the grafitti outside the son's daycare center). As Smith showed, it's up to each person to make the most of his pursuit. With July 4th coming, Chris Gardner reminds us all of what makes America so great. so which friends were you watching the movie with? Friends that call us on Saturday nights to see if we want to do anything. I was just thinking of seeing the movie, now I'm leaning against it. :P who can do anything on a sat. night these days when shabbos is over at 10:30? !